Located in scenic Summit County, Ohio, Breakpoint City was built from the ground up as the nation’s first hovering city after a generous donation by the Sploz Corporation. Though only a few decades old, our city is widely recognized as the global leader of cutting edge technology. Our many spaceports and unique dining make the city an inviting spot for travelers from every corner of the galaxy. Breakpoint also is the current home of Sploz Co, makers of everything from advanced holography operating systems to fat-free yogurt. Ben F. Megawattis an inventor from the past with the power of electricity. Sofia Jaypeghails from the future and uses that extra 1% of her mind to thwart crime. Dan, Ben’s pet dog, is powerless, but dreams of one day overcoming his "second banana" status. Can an inventor, a superhero, and a talking dog survive life in a fast-paced future? Most science fiction focuses on the future of major parts of the Earth: New York, 2320, Tokyo 4470. But what’s life like in the rest of our world? 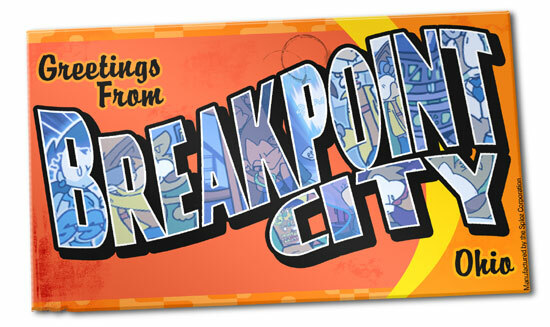 Well, Breakpoint City is the answer in search of this unasked question, with plenty of breakfast-related jokes along the way. With luck, we’ll be the greatest midwestern space opera since Lake Woebegon: 2031. Brian Emling has been drawing cartoons. Brian is a new media design graduate of the Rochester Institute of Technology, and is now ironically working in the same part of the country that his comic takes place in. When not comicing, Brian enjoys writing about himself in the third person, though that will hopefully stop by the end of this paragraph. Brian can’t wait.